This program plays the popular card game of whist and knock-out whist with the benefits of playing through windows. You can choose your style of play, as well as customising for different rules. It comes complete with a comprehensive help file which describes the rules and playing logic. So, it is ideal for expert and beginner alike. This version has various playing fixes and enhancements. 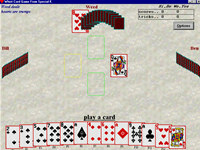 WHIST Card Game From Special K is a game that works under windows xp, windows vista and windows 7. It supports both 32-bit & 64-bit windows editions, therefore it could run faster on 64-bit computers. Estimated download time for WHIST Card Game From Special K on a common adsl connection is less than a minute. Version 3.13 was released four hundred seventy three days ago by Special K Software. Click the green download button to download it now.